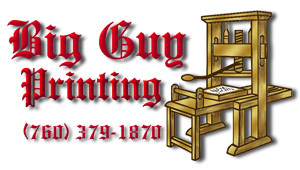 Big Guy Printing, owned and operated by Drew & Shanna Lander, is the only complete, in-house printer in the Kern Valley. The shop is run in old "country store" style, with plenty of local characters sit'n and jaw'n. Stop by, enjoy the abuse, have a cup of coffee and gab awhile. Service is fast and the prices way below big city printers. The "Big Guy" not only takes care of the locals; even large outside corporations like EXCEL send in their orders for fast turnaround and quality. Call him today for quotes on your printing requirements. Located on the Blvd. in Lake Isabella.